Cookies. I love 'em. A sweet tooth. I've got it. 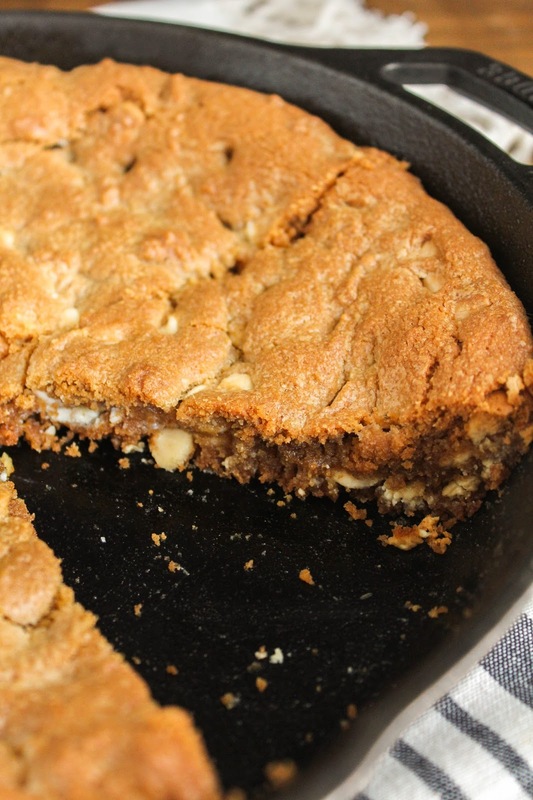 This skillet cookie took care of that problem for me last week. When you're really in the mood for some cookies, but you're pressed for time and don't want to bake a whole batch. Or you're just really impatient, like me, a skillet cookie is the answer. 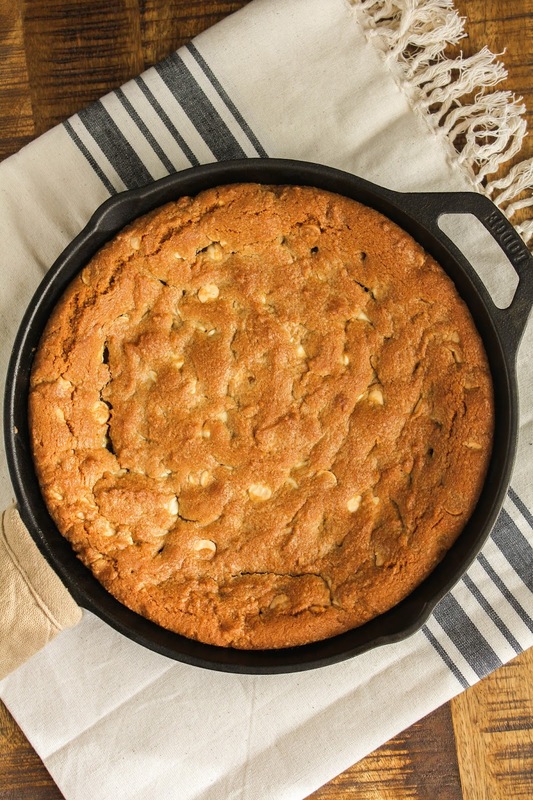 You're essentially making cookie dough like you normally would, but pressing it into a skillet instead of individual cookies. In 30 minutes you'll have yourself a hot, delicious and GIANT cookie, fresh from the oven. And it feeds a crowd, too. So it's perfect if you have company, or if you're just feeding your family. I received a few different flavors of Peanut Butter & Co. peanut butters to play around with and the White Chocolate Wonderful was sitting on the counter calling my name. Peanut butter blended with sweet white chocolate, that was MADE to be put in a cookie, dontcha' think? Obviously I did. 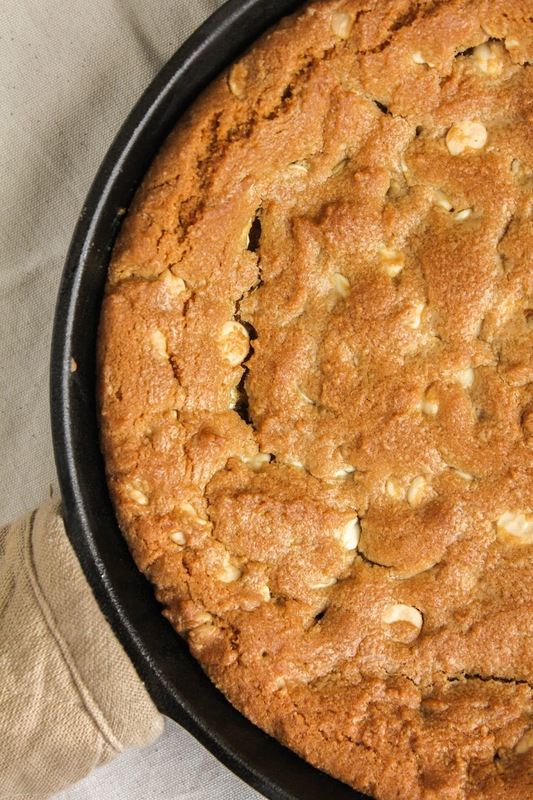 So I made a peanut butter cookie base and topped it off by adding white chocolate chips, too. Let me tell you, this cookie is good. So, so good. My two boys and I had the skillet gone in just a couple of days. Hey, don't judge us. They have a sweet tooth just like their mama! 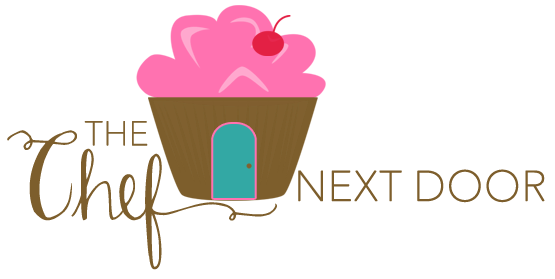 Be sure to check out the Peanut Butter & Co. website to find all of their amazing peanut butter flavors and to get more delicious recipes! You can also visit them on Facebook, Twitter and Pinterest. Now, let's get baking! Preheat the oven to 350 degrees. Rub a tablespoon or two of softened butter all over the bottom and the sides of a 9-inch cast-iron skillet; set aside. In a medium bowl, whisk together the flour, baking soda, and salt. In the bowl of a stand mixer, beat together the butter, sugar and peanut butter until light and fluffy. Add the egg and vanilla and mix until combined. On low speed, add the dry ingredients to the mixer and mix until combined. Fold in the white chocolate chips. Pour the cookie dough into the prepared skillet and press down evenly. Bake for 25 to 30 minutes, or until the edges are crisp and the cookie is golden brown and cooked through. Allow to cool for just a few minutes before cutting into slices. Serve warm. Serve with ice cream, if desired. Disclaimer: I received Peanut Butter & Co. products at no charge to use for recipe development, however, all opinions are my own.